After much planning, preparation and excitement the Deadly Didge N Dance Festival was held at Palm Island over the weekend and what a success it was! 2018 marks the centenary of the first forced placement of people on Palm Island. 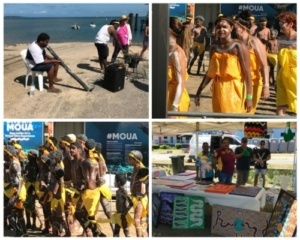 The centenary and the event, provided an opportunity to reflect on the past 100 years, to celebrate the time now and to invest in a new future for the people of Palm Island. Amidst the music, dancing, workshops, storytelling, poetry, markets and more, the event drew over 1200 additional visitors, over 100 additional performers, a number of visiting dignitaries (including the Deputy Premier and Bob Katter) and visiting celebrities. Better still, we’re proud to announce Palm Island has made it to the Guinness World Records taking out the title of Most Indigenous Dancers Dancing the Same Dance at the Same Time. We’ve been told even our very own Mallory Morgan was there shaking a leg for the history books! I would like to thank all our drivers and activity staff and activity participants who assisted the PIASC in the preparation of the event.- Nathan Vinson, Program Manager CDP. Area beautification, mowing of parks, creeks and main access areas to the event (David Baira Greening Team). Assistance in the making of customs and lanterns (Indoors Arts & Culture Team). Volunteers for stage preparation, Palm Island Ambassadors and Camp Site Ambassadors (Media and Arts & Culture Teams). Final preparation of the event. An outstanding effort from Peter Sherry, Robert Youngblutt and Raymond Johnson for organising the teams to assist the PIASC. Volunteers for the running of the Lost Artists of Palm Island stall, (Agnes Wotton Arts & Culture Team), who sold some great paintings and numerous postcard and bookmarks. Finally our Activity Supervisors who gave their time and their weekend to provide transportation to the community over the whole duration of the event. A big thank you to Peter Turner, David Baira, Alfred Ryan, William Marpoondin, and Janice Kerr. The Mayor of Palm Island, Alf Lacey, personally thanked me for the support CDP and Campbell Page provided to the event. So from me again a big thank you to everyone who gave their time to support this remarkable event in Palm Island history. – Nathan Vinson, Program Manager CDP. Congratulations to everyone involved in such a worthwhile event. The Palm Island Community Development Programme (CDP) is a remote employment and community development service. Palm Island CDP aims to help people find work, while allowing them to contribute to their communities and gain skills at the same time. To find out more visit our CDP page or Contact us.